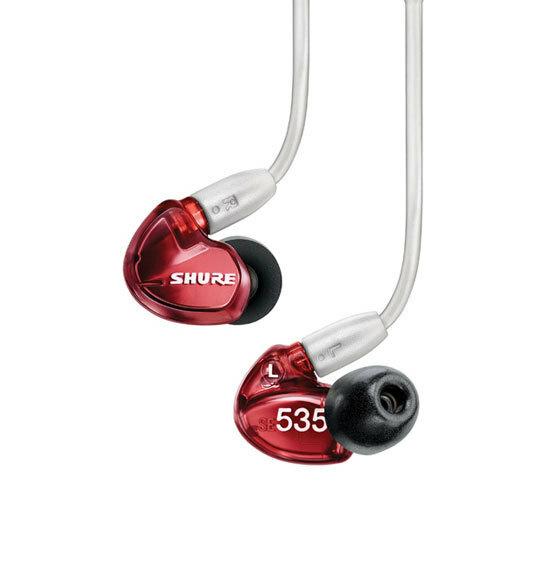 Shure SE535 Sound Isolating Earphones - Available in Limited Edition Red, Clear and Metallic Bronze. The Shure SE535 Sound Isolating Earphones feature triple high-definition drivers for spacious sound with rich bass in a secure, low-profile fit and innovative detachable cable system. Comes in Red (Limited Edition), Clear and Metallic Bronze. The Shure SE535 Clear and Metallic Bronze ship with a 3.5mm detachable cable that is 1.62 Metres long. Limited Edition Red ships with a shortened 1.16 Metre long cable. The Shure SE535 utilises Triple High Definition Micro Drivers – a dedicated tweeter and dual woofers for incredibly spacious sound and rich bass. It is the choice for discerning professionals and audiophiles. Triple high-definition drivers deliver spacious sound and rich bass for cinematic audio in a convenient and portable package. Special Edition (Red Version) available with a distinctly tuned frequency filter and a unique colour scheme of red earphones paired with light grey 3.5 mm audio cable in shortened 46" length. The SE535 is ideal for in-ear personal monitoring and for mobile listening devices. The detachable, Kevlar reinforced cable with formable wire allows for easy replacement and secure, comfortable fit.